My son, Dennis is a great cook! We learn a lot from each other. He shamed me when he discovered that I was throwing away my vegetable peelings and scraps. Homemade vegetable broth is SO SO much tastier than anything you can purchase. I feel that it has a more neutral flavor and thus doesn’t overpower and conflict with whatever your final product is. Keep a freezer bag handy when cooking. Add to it all your vegetable peelings, cut off ends of vegetables,mushroom stems, stems from herbs, wilted lettuces, the skin from an orange, a few peppercorns. Keep the bag in the freezer and when full- voila! You have the base for a great broth. Put the contents in a stockpot, add maybe an onion or carrot, cover with water and bring to the boil. Boil uncovered for about an hour. Strain the soup through a fine mesh sieve and portion into containers. Cool thoroughly and freeze until ready to use. This dish is my version of a pasta that Chef Eric of Bistro Rollin often makes special for my husband and me. Bistro Rollin is a wonderful restaurant in Pelham owned by the great hosts, Barbara and Arthur Bratone- our favorite Friday night hang out! You’ve all heard of Pasta Primavera- right? Meaning “springtime pasta”, because the vegetables used in that dish generally make their appearance in spring. I’ve named this dish Pasta Estiva , meaning “summertime pasta” because the vegetables here appear in summer (and through early fall) at your local farmers’ market. Meanwhile, in a large sauté pan heat 2TBS of the EVOO. Add the corn kernels and sauté for about 2 minutes. Add the garlic, cook another 2 minutes. Add the zucchini, carrots and cherry tomatoes. Sauté over medium high heat, until the vegetables are wilted and just cooked through. This should take about 5-7 minutes. Add salt and pepper to taste. Set aside. Cook pasta according to package directions. Reserve ¾ cup of the pasta cooking water. 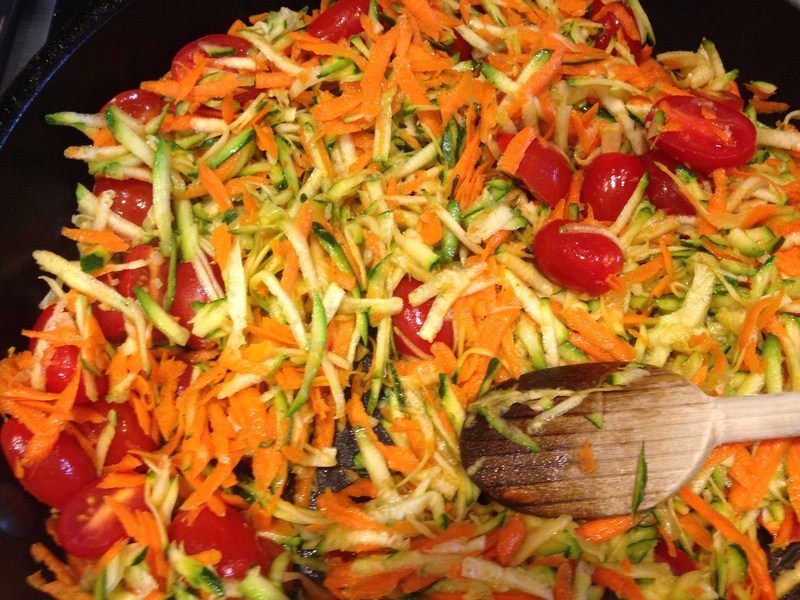 Drain the pasta and add to the pan with the vegetables. Heat over medium heat- adding some of the EVOO and some of the pasta water to loosen the vegetables and make a “sauce”. Add the shredded basil and enjoy! This cake is very easy to make, and utterly delicious. 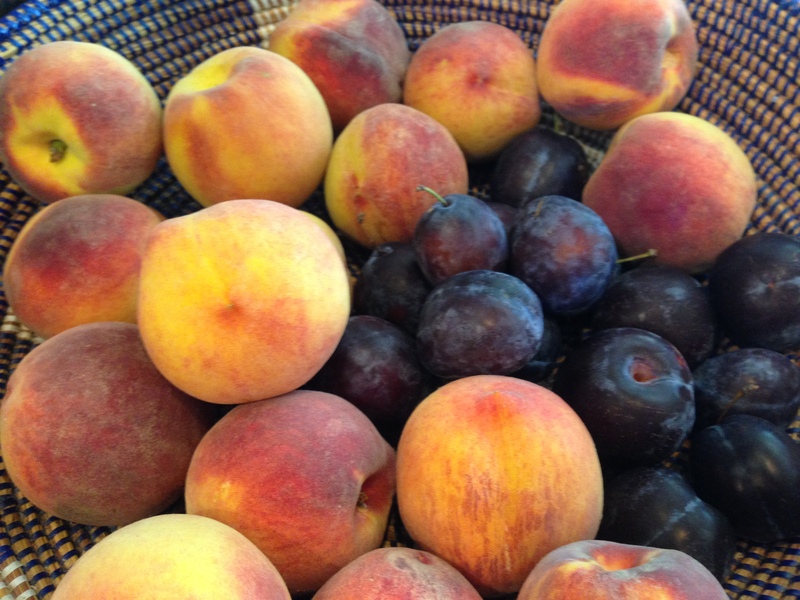 It makes use of of the season’s bounty- hurry and try it while you can still find Italian Plums at the farmers’ markets! And – it’s dairy free! Heat oven to 350. Coat a 9” cake pan with olive oil and dust with flour. Whisk together flour, cornmeal, baking powder and salt. Set aside. In a large bowl, whisk the sugar and olive oil until completely emulsified. Whisk in the eggs one at a time, then the vanilla and lemon zest. Gently fold the flour mixture into the wet ingredients. Combine thoroughly. 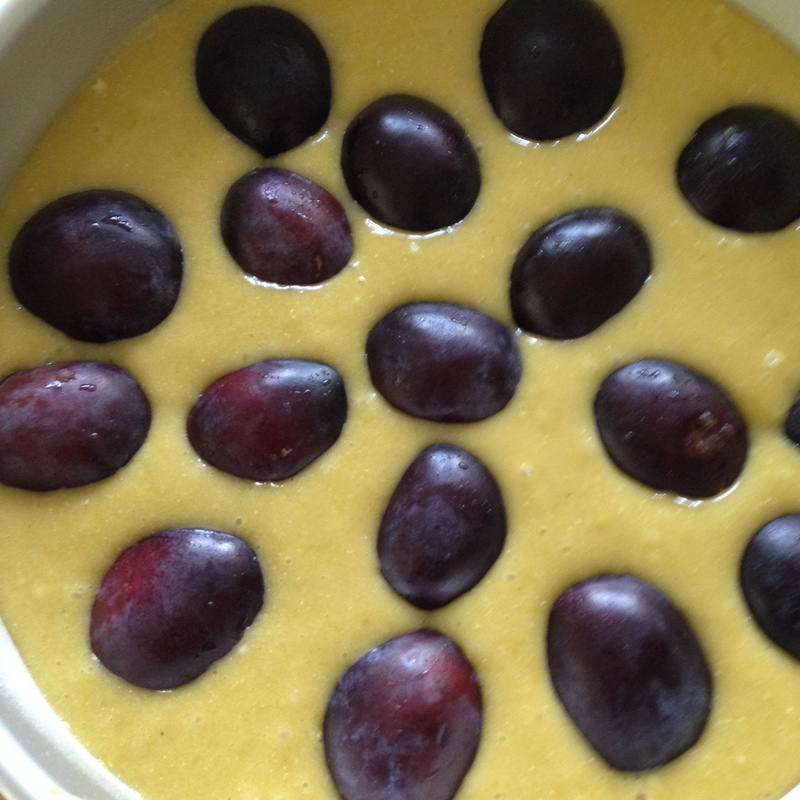 Lay the Italian Plums cut side down on top of the batter in concentric circles. Bake 25- 30 minutes or until a cake tester comes out clean. Cool 15 minutes on rack; unmold cake, turn plum side up and finish cooling on rack. Dust the top of the cake with Confectioner’s Sugar. 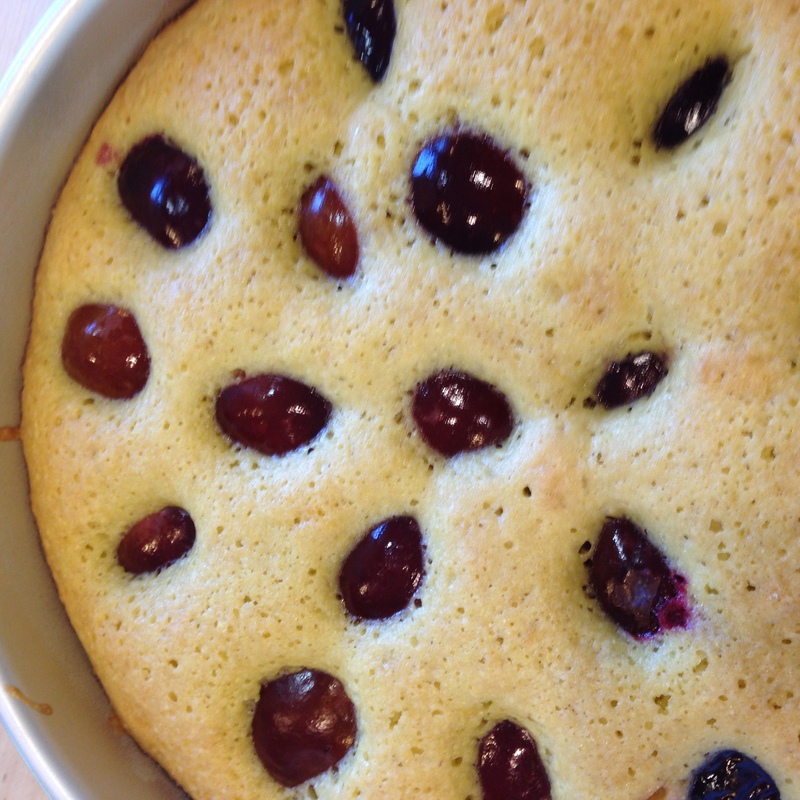 BAKER’S NOTE – This cake is equally delicious without the addition of plums.